Cleckheaton Under-9s in action during last Sunday's games against Old Brodleians and Bramley. Cleckheaton Under-10s continued their recent good form against two well organised teams Bradford & Bingley and Skipton. The first match, against a joint Bees Under-10s and Under-11s side, was evenly matched. Excellent driving runs from Sam Booth and Sam Jackson provided great field positioning and penned the Bees back. Strong and fearless tackling from Declan Wilson and Thomas King ensured that Cleckheaton remained in contention with the final score being honours even at 7-7. In the second match against Skipton, Cleckheaton gained possession several times with robust rucking from Sam Nolan and consistent backing up from George Nelson. This provided the platform for Jaydon Cuffe to score a brace of tries. The 100 per cent effort award winner William Carden made mesmerising runs and found gaps in the defence, while player of the match William Nicholson’s route one approach of try scoring led Cleckheaton to a comfortable win. Alec Manby’s efforts in his first match earned praise, while support came from the rest of the Cleck team. Cleckheaton Under-10s welcome boys and girls interested in playing rugby. Training is on Wednesdays between 6pm to 7pm and matches take place on Sundays, with further information available from Hannah Curley on 07986 875603. Cleckheaton Uunder-8s split into two teams as they faced Skipton and the Bees. Bees and Skipton took early leads in the games before Cleck responded with good tagging. After spilled balls from both Skipton and Bees, Cleck picked up and went on to crash over the line to pull the score back. After much great tagging and some fancy footwork from both Cleck teams they managed to secure victories. 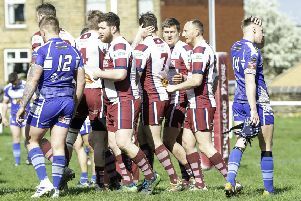 The two Cleckheaton teams then swapped to play the other opponents and after another slow start, they worked hard and showed determination to again run out winners. Players-of-the-match went to Lucas McGuigan and Charlie Thirwall for excellent tagging, running and passing. Cleckheaton under-9s entertained Old Brodleians and Bramley last Sunday. Having bounced back from defeat with a strong performance away at Yarnbury the previous week, Cleckheaton were looking forward to the double header and had their biggest squad of the season with three new players adding to the team and Joel Pratt returning from a month out injured. Old Brods brought a strong squad and the first match was closely fought, Cleck battling for a hard earned 3-3 draw thanks to a storming try from player of the match Bowen Galligan. Bramley are a new squad, so Cleck took the opportunity to field their new players and everyone impressed in a 7-2 win. A second match against Brods was played and the rugby was fast and flowing. Cleck produced their best tackling display of the season as old and new players gelled together. Strong attacks came from all players, with stand out runs by Jenson Senior and Samuel Hemmingway helping Cleck to a 5-3 win.